Home » Posts Tagged "ing"
I have a pet hate for leaving shower gel’s, soap, flannels and shampoo lying around the bath tub or showering area, so why not use one of these shower caddies ? The first one on the left is a chrome double corner deep basket it is a fantastic option for storing your soap or bathroom essentials whilst keeping them close to hand and neatly stored. There is plenty of room to leave shampoo bottles standing upright in the bottom basket. a real family solution. If you wanted to create a neat solution without using a double then why not pick and mix by using two or even three separate corner baskets to create a shower caddy and fix them to the bathroom wall at the heights you prefer. As an example I have chosen the Dakota corner and selected the deep basket as they come from the same range, you could also use two the same size which would work just as well. 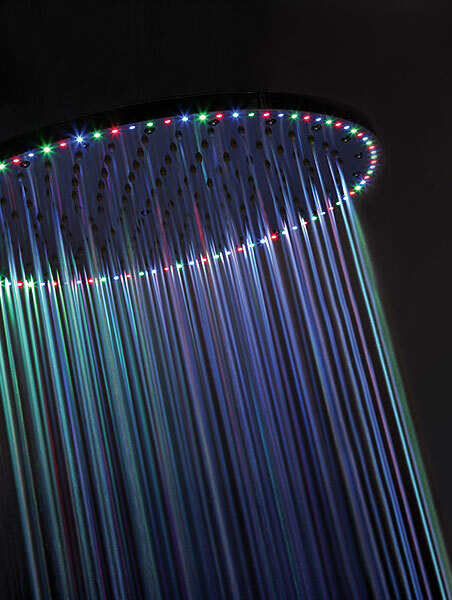 Â Crosswater’s Rio Led Shower head will defiantly impress your guests, a new experience for all with the coloured lights appearing to move around the streams of water, It is 400mm in diameter mains powered and comes with an electronicÂ key pad that controls the 96 LED lights with 12 different program modes. The shower head is made from Chrome plated solid brass and is an ultra thin design and manufactured from the highest specification. It requires 3.0 bar pressure as a minimum pressure. 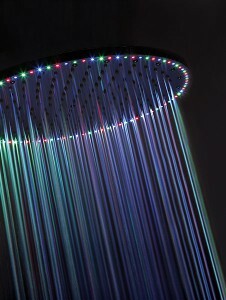 The Crosswater Rio Led shower head comes with a 15 year Guarantee. Introducing the QL2 Shower Valve and rectangular shower head from Tapstore.com this product was shown to me by tapstore recently and I loved it, the quality of the thermostatically operated shower valve was evident immediately, the front plate is made from 6mm solid brass chrome plated the handles are also solid brass chrome plated, the valve cartridge is temperature sensitive to 1°c and is as smooth as a baby’s bum in control. 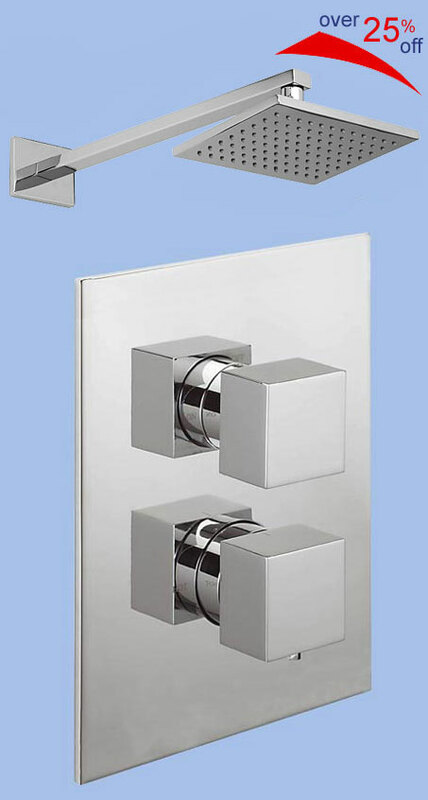 To compliment the shower valve they have put this together with their QL2 shower head (200mm x 145mm) also made from solid brass with chrome plating and rub clean jet nozzles to aide the cleaning of lime scale build up, the head measures 200mm x 145mm and is only 10mm think. 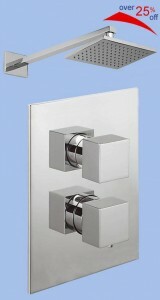 The square shower arm is 400mm long. This QL2 shower valve and QL2 Head pack is suitable for both high and low pressure water systems and requires a minimum operating pressure of 0.2 bar. Guaranteed for 10 Years, RRP £670.00, Tapstore’s current autumn sale price £489.00. *There is a special extra 5% discount on the whole QL2 range if you mention The Bathroom Designer website on any orders before Christmas. Showers By Samuel Heath When it comes to design you cannot beat this traditional classic thermostatic shower with a 12″ rose, rigidÂ riser rail, hose handset and diverter, The Samuel Heath name is synonymous with the creation of luxury showers, bathroom taps, and bathroom accessories. Samuel Heath’s collection of Classic showers brings together nearly two centuries of craftsmanship combining skills with the latest in design and manufacturing technology. Design, innovation and quality have remained their core values since the company was founded in 1820. Available FinishesÂ Chrome and Antique Gold. Available at Tapstore.com for Â£1345.00 including VAT and Delivery.